Thriller author Jenny Milchman writes page-turning novels of women in jeopardy — and the courage and resourcefulness they find inside of themselves in the face of danger. Check out Jenny’s website for information on all of her books and to check out her blog. In addition to writing thrillers (all of which were chosen as Indie Next picks) Jenny is on the board of International Thriller Writers and interviews writers for the radio show, Next Steps with Jenny Milchman and ITW on Authors on the Air. And if that weren’t enough, you can find Jenny on Facebook, Twitter, and Patreon. Whew! Jenny gives shout-outs to two books: The Freedom Broker, by K.J. Howe — a debut novel and the first of a series of high-octane thrillers — and We Need to Talk About Kevin, a tense and intimate look at a family destroyed by violence, by Lionel Shriver. 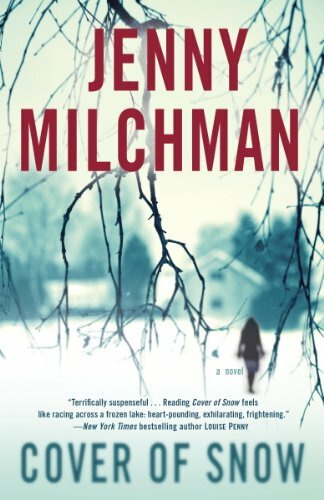 Laura Brennan: Jenny Milchman is an award-winning, critically acclaimed novelist who writes un-put-downable thrillers. Her debut novel, Cover of Snow, won the Mary Higgins Clark Award for best suspense novel of 2013. All three of her novels published to date, including Rune Falls and As Night Falls, have been Indie Next picks. Jenny interviews thriller writers for the Next Steps radio show and I am delighted that she agreed to be on the other side of the microphone for this chat with me. Jenny, thank you for joining me. Jenny Milchman: Laura, thank you for having me on. LB: Before we get into your books, let’s talk a little bit about you. I understand that your folks were a little worried about this whole writing gig. And then when I was a sophomore in college, my parents got to that point where they had to ask what the point of this expensive degree was, I told them that I wanted to be a poet and live in the woods in a log cabin of my own making. And they pointed out that I had never really picked up a hammer, and our country is not that nice to its poets anyway. And they said, is there something else you can imagine doing? And since there was, we went with that. LB: And that thing was psychology. JM: It was. And I practiced for 10 years, yes, as a psychotherapist in a rural community mental health center. LB: It’s so fascinating, because you’re not the first or even the third author I’ve spoken to who has gone into psychology. What do you think is the connection? JM: I think there is a connection, I really do. And, to a certain extent — I wanted to be a poet, I didn’t have the kind of books that I wound up writing in mind when this whole desire to be a writer but put it aside thing happened. And it didn’t reawaken until I was a psychotherapist practicing in this rural clinic, and I had this very scary case. And the case was a little, blonde, five-year-old, adorable cherub of a child whose mother had brought her in because she had just killed the family pet. And it was almost as if life was a suspense novel. And I sat down and just to deal with this overwhelming case, I started writing the first book that I’d ever really written. I did short stories, I did poems, but I had never written a novel before. And so, when you talk about the connection, I think what it is, is that we’re there, as psychotherapists, hearing people’s stories and coming into their lives at this very intimate, very troubled time, and what else does the novelist do but exactly that, except with fictional lives. LB: That is fascinating. Dare I ask, did the girl grow into reasonable adulthood? JM: She did! And you know, killing pets, that’s a sign of incipient sociopathy, it can be a very, very big red flag. And by the way, the novel that I wrote out of this overwhelming case never got published because it was far, far, far too biographical and there’s a confidentiality. But the girl did, I saw her again when she was probably 13 years old and she was doing just fine. She was one of my longest standing cases. We continued to see each other for very long time. It was a little bit of a triumph, I guess, that she was able to come into her own in such a terrific way. LB: There must be enormous satisfaction in being able to go in and really help people. JM: I loved it. I loved it, and I started out on the psychiatric emergency team. We were the people who would be there, there was 24/7 coverage. Sometimes I would do the overnight shift, sometimes it would be a little bit more manageable than that. But we were really there, yes, with people at the most pivotal periods of their times. And at the end of the shift, you could sometimes go home and say, I changed somebody’s life today. Or, I was there at a much-needed moment. And there was such a sense of satisfaction and fulfillment really. And the only reason that I gave it up was, I was sitting in a psychotherapy session one day, and I had a notepad. I didn’t take notes all through the sessions, but sometimes I would jot something down that I thought would be helpful for client later on to remember. So I had a notepad and a pen, and I had this overwhelming urge to pick up the notepad and write down a note about the scene I was working on in the book I was writing. And I said to myself, I can’t do this. I’m not giving the right amount of myself to this person anymore. My thoughts are somewhere else. I was focused, I was in the session, but I was also in this made up world. And that was when I realized, I really need — you know, this is been a wonderful journey, hopefully for my clients, definitely for myself. But I need to do something that was always there in my heart. LB: The whole idea of going in and helping people at a pivotal moment in their lives, you did translate that directly into your novels. In all three of your novels, it is a pivotal moment in your heroine’s life that takes that story forward. JM: Yeah. That’s funny that you say that, because I think you are exactly right. I think that’s what I’m drawn to, that’s the kind of story I’m drawn to reading and writing. What is that one moment where everything is about to change, and if the heroine, if the character can do what is deepest inside her, do what it takes, it can come out all right. And if she doesn’t, that’s going to be the end of it all. I’m really drawn to that moment, just as you described it. LB: So your first published novel was Cover of Snow. LB: And we already know that wasn’t the first novel you finished. JM: It was the eighth novel I wrote. LB: That is incredible. What dedication! JM: What a lot of disappointing years! Yes, yes. Dedication is the nice word for it. LB: You’ve been very upfront on your blog, on your website, in interviews about how difficult the journey is as a writer, prepublished, even after you were published. You want to talk a little bit about that? Like, what was the surprise for you in all of that? JM: Oh, gosh. You know, the story I tell is that, when I wrote that first novel, and I remember giving it to my mom who is a great, an incredibly picky reader, and she said to me, Jenny, I think this is going to happen for you. I think you have talent. But I also think there are numerous flaws in this book. She didn’t say that, but there were. And you’re a complete outsider, and this is an industry. I think it’s going to take a while, I think you should be prepared for 10 years. And I just flared up at her. I said, you don’t know anything, you’re an outsider, too. You don’t know the industry. And it took 11 before my first book was published. I don’t know how to explain why it is as hard as it is. But I’m honest about it because I think we all need to know that. We need to know this is not something that you can just pick up on a lark and expect to get there. And when the inevitable disappointment and frustration comes, you’re not alone. We’ve all experienced it. And if we can get through it, there’s something on the other side. LB: So let’s talk about Cover of Snow. So that is the first one that did, in fact, get published, 11 years later. What was the genesis of that story? JM: So Cover of Snow is about a woman who wakes up and finds her husband missing from their bed. And the way the story came to me was a question kind of grabbed hold and really tugged at my heart. The question was, what would make a good man do the worst possible thing to his wife? That was the question. And at that point I didn’t even know what the worst possible thing would be. It wasn’t… I don’t want to give it away, I really don’t want to give any spoilers. JM: So that’s what I thought. For the longest time, that’s what I thought. That’s why it came to me, that’s why I sat down, I had to answer that question, what would be the worst possible thing and then figure out why did he do it. It ends up being a very unraveling story that goes back to an event that occurred 25 years in the past that the wife who wakes up wasn’t even aware of at the time that she married her husband. So it’s kind of a twisty tale. But I’ll just say that, I was giving an interview when I was on tour for Cover of Snow back in 2013 and somebody asked me this question, Laura, where did the novel come from? And I sort of said what I just said now. And the interviewer pressed a bit and said, well, I feel like there’s more to it than that. And I ended up telling this story about something that happened to me when I was eight years old that I’m not going to describe because it would be a spoiler, but I think that’s probably the genesis of where the story was. Something that happened in my childhood that I wasn’t even aware of all those years later, but I think as writers, we cast a very wide net. And we don’t even know what’s going to go into that net. But parts of it are going to come out and end up being the stories we write. LB: Well, I do think we work out some of our own themes at least, the things that interest us come from somewhere. LB: You have — trust is a big theme for you in all your novels. JM: Ah, that’s interesting. Nobody’s said that before. JM: I don’t think so. No, my face, if you could see me, my face is heating up. Trust, huh! That’s interesting. LB: I’m thinking of Ruin Falls at the moment, where almost everyone she ever trusted betrays her at some point in a big way or a small way. JM: You’re right. Yes. You’re absolutely right. LB: And one of the things I really loved, and again, no spoilers here, but you handle that betrayal of trust in a different way in each of your three novels so far. JM: What the heroine does with it when she’s betrayed, you mean? LB: Well, and also, who betrays her and on what level. JM: Right. That’s true. It’s funny, one of my editors observed that the husbands don’t do well in my novels, and that’s for the most part true. But I think you’re right that it’s more about the woman’s reaction to it, and what happens to the husband is the collateral damage in the story. LB: And the husbands have each been very, very different men. JM: You know, I always saw it as maybe from the inverse from where you’re going with it. If we take a woman and strip her back to the very weakest, smallest person she is, then what does she do? What did she do with that and how does she, like a Phoenix, climb out of the ashes? And that part felt very connected to who I am in a psychotherapy sort of sense. Issues that I’ve dealt with, why do I feel frail and weak at times, and maybe I haven’t climbed back. I frequently say, my heroines are who I would be if only I were braver and stronger. But I think what you’re doing is you’re sort of seeing it from the perspective of the people in her life and how they in a way have joined her at that moment, or maybe even gotten her to that moment. LB: But one of the things that this brings up, too, is something that other readers have noticed, a lot of your fans, one of things I love about your books is how unique the characters all are. JM: You know, they feel like real people to me so, insofar as every person we talk to is different, you’re right, it’s not a “husband character,” it’s Paul the organic — what would be the right word for him? The organic orator, or, I’m trying to think of a word for somebody who is a little overzealous in his efforts. The organic zealot. And then it’s Ben who’s the outdoor enthusiast but has to learn that being strong is not going to necessarily get him through this crisis. And of course Brendan in Cover of Snow, about whom the secret centers. LB: Right. I love that the husbands, the competence isn’t always — you would think that competence would be a positive quality, but it isn’t always. JM: Oh, wow! You say the most interesting things. Yes, that’s true. That’s true. And in a way I think this goes back to what I was saying, which is that devoid of what you would think would make a heroine be able to triumph. She is not a gun-toting — there’s a wonderful book out now by a good friend of mine who goes by her author name is K. J. Howe and the book’s called The Freedom Broker, I’ll give it a shout out. And the character in it, Thea Paris, has this incredible specialization, this set of skills.She happens to be a kidnap and ransom specialist, which is a very interesting world. But you know, that, I think of in a way as almost the antithesis to my books. Here is somebody who knows what she’s doing and if she can apply the skills correctly, she’s going to triumph. And my heroines usually have none of that. They really feel a lot like me. If you stuck me in a house on a mountain with two invaders coming to it, which is As Night Falls, I don’t know what I would do. Maybe I’d call my mommy? I really don’t know. But my heroine has to figure it out and that’s the part of the journey I love realizing with her. LB: Well, let’s talk about As Night Falls because the different characters aren’t just sort of helping or hindering the heroine’s story, everyone in that book has a stake. They all have their own story. JM: Oh, I like that. Yes, you’re right. They do. LB: So how did you develop this story? JM: So, As Night Falls, there’s a funny thing about it, first of all, which is that it was published in June of 2015 and it’s about a woman, her teenage daughter and her husband who live in this mountaintop home in the depths of the Adirondacks wilderness and two escapees from prison show up on their doorstep and force their way inside. In Mayof 2015, a month before the book came out, two escapees from an Adirondacks prison ran off into the wilderness and remained on the loose almost until the book was published. Of course this led my editor to say, best publicity stunt ever, of course it wasn’t since the book was written a year before this happened. And in going back to what the origins of it were for me, my answer is I have no idea. For every single book I’ve written, and I mean the unpublished ones as well, for all the books I’ve written, I know how they came to me. I have that genesis story, that origin story. And for As Night Falls, I have no clue. In fact, there’s a twist in the middle of As Night Falls as you probably know, and the whole story sort of changes — I didn’t even know that was going to be a twist until I was a quarter of the way through and I was like, oh my gosh! It almost seems as if the reader wouldn’t have to know what I know, and if I didn’t let them know it, it would be an awfully great surprise. So the whole thing came to me almost page by page. I just sat down and the story unrolled itself like a carpet. LB: I also am just so taken with the psychological moments, and specifically I’m thinking of As Night Falls. Again, no spoilers, but there’s a moment when you have the character of Barbara and her children are trying to make her aware of something, make clear what is going on, and she just wanders off wanting a cup of tea. And I just felt that that was so real, that everyone who has ever, you know, been an adult and dealing with your parents, that trying to be on the same page can be such a struggle. JM: Barbara, who is the mother of the heroine in As Night Falls, Sandy — Barbara is a character who really does grip me a lot. Not a character from personal experience but probably, yes, from my psychotherapy background. Even more, there’s a book by Lionel Shriver called, We Need to Talk About Kevin. And I kept going around the country with As Night Falls and trying to implore people to see that that was a big inspiration when I was writing As Night Falls. And they kept saying things like, I couldn’t imagine more different books. That book is quiet and interior and yours is suspenseful and on the page… But it really was a huge inspiration because in that book, Shriver was dealing with a mother who would not let herself see her children’s need in the way that you described it and most particularly, her children’s anger. She really needed, there was almost a psychotic denial of the anger in the child. And that’s what led to the events in We Need to Talk About Kevin. It’s very much the same actually, in As Night Falls. What I saw as a psychotherapist was that children want their parents to set up limits. And it happens in small ways at first, I have 30 lollipops? Or three lollipops? And then if the parent doesn’t push back, the behaviors will inevitably worsen. And to go full-circle and come back to the client I was talking about, that’s what happened. There was a need not to see the way this child crying out for help with her negative feelings. And I need to sort of sugarcoat them and paint over them. And that creates really distorted and extreme behaviors in children and in grown-up children. So I think that’s my long answer to yes, the psychology background comes into play. And also just that that character really does haunt me, somebody who refuses to see what her kids need to tell her. LB: You’re also involved with the organization International Thriller Writers. JM: I love International Thriller Writers! I’m a board member now, I was chair of the debut authors program, which is a great opportunity if there are writers out there who are about to have their first books come out. Or not, who are thriller, suspense, mystery writers who are further along in the game. Definitely seek out International Thriller Writers. Membership is free, and it goes back to what we were talking about, where the stories come from and the disappointment of rejections, and writing is a lonely business. We need community. Radio shows like this one, I think build a virtual community and people can trade the podcast links and talk about what they heard and ITW is sort of like that, in person. Every year there’s an annual conference and it’s people sitting around, like-minded, talking about the business and their latest books and their hopes and their fears. Somebody famously said, this is the only place I can go where everybody kills people for a living and not feel weird. LB: Do youwant to talk at all about the difference between thrillers and traditional mysteries? JM: Yeah, that’s a great question. It really is. And I think it’s a changing question. I think of thrillers as, there’s action on the page and there is a sense of being in the moment and a crisis right now. My first literary agent had a really good description, she said a mystery is a puzzle and a thriller is a ticking clock. And I do think that goes into it in large part. But for me the difference has to do with the immediacy. In a thriller, in one of my books, you’re really engaged in that battle with the characters. And in a mystery, the story can be taking place after the event, the murder could have occurred and the whole mystery could be about unraveling it, and it’s much more cognitive and interior and cerebral, I guess. Versus taking a page of a character’s life and joining them there, in it. LB: I think that’s a great description of it. So what is next for you? JM: I am very pleased to say that after a year long hiatus where there was a real upheaval at my publisher and my editor to whom I dedicated As Night Falls and really just loved, was let go. And so — you know, I married the first man I really dated. We’re not that old, but it’s going to be our 25th anniversary in a couple of weeks and I sort of thought when I signed on with my publisher that, perhaps naïvely, 50 books later she and I would be together and that’s not, unfortunately, the way it went. So I had to go out there again, I had a new book and I thought, well, but now I have three books out and I’ve been lucky enough to win some awards and stuff like that. It’ll be easy. It’s never easy. So there was a year while my agent and I perfected that book and I was lucky enough to have some great authors help me with it and she, just before the new year, was able to sell it at auction. It will be coming out in spring/summer 2018. LB: What is the title of that new book? JM: the new book is called Wicked River. And it’s about a honeymooning couple who go off into the wilderness and run into the worst the woods have to offer, and the worst inside themselves. LB: Oh, that’s very exciting. So, if people want to keep up with you, where can they find you? JM: My website is easy, JennyMilchman.com. The name might be a little hard to spell, you’re one of the few people that pronounce it smoothly right off the bat. It’s JennyMilchman.com. And I’m on Facebook and Twitter, I’m really all over the place. I have a new newsletter that’s going out these days, you can sign up for that with some really fun stuff and inside industry tidbits that I think a lot of people are not necessarily sharing, but I kind of tell it like it is. And I’m also on Patreon, which is a fun site where readers can connect with writers and get works of the writer before they’re published and stuff like that. LB: Well, that’s fun. I will link to those in the show notes. Thank you, Jenny, for joining me today. JM: Thank you for having me. It was such fun, Laura.